Skateboarding and Religion are an unlikely combination. As a recruitment tool they are perfect and I'll tell you why. 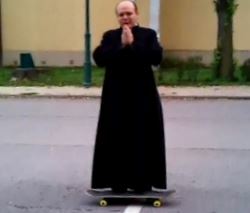 The this viral video "a pap gördeszka gyorstalpalót tart Lentiben" a priest takes a skateboarding crash. Illustrates a point that many in the church have understood for a while now. Skateboarding and religion brings together rebels and conformists. Also many see religion as the expression of being "good" and skateboarding as being bad. Those who have made religion their life and career have seen this. They can see that teenagers are at an impressionable age. Many who pick up skateboarding are youth who may be be at risk of getting into mischief. These kids are the perfect target for recruitment into religion. Put better, these kids are in need of guidance and a sense belonging. Some think the church can provide that. The church has known this for a while and has done plenty in my experience to capitalize on it. I remember years ago seeing skateparks in the USA sponsored or run by a church. They knew that if they could provide a place for the kids to have fun and belong. All the while making it known that the church cares. Some of those kids would stick with the church. They could meld Skateboarding and Religion together. While living in Vancouver I went to the underground parking lot for Skate church often. Seeing many young kids there skating and bmxing through the winter. They provided hot chocolate and a safe dry place to skate. It was great! I even remember seeing one or both of the Decenzo brothers there too. The church knew there was nowhere to skate in Vancouver when it was raining so they made a place. The only thing they asked for in return was to stop skating and joining in a prayer circle for a few minutes. To give thanks to God. It was a painless few minutes and I didn't mind. Some of my friends were a little resistant but it wasn't that big a deal. The Leap of Faith is an famous spot shown here. 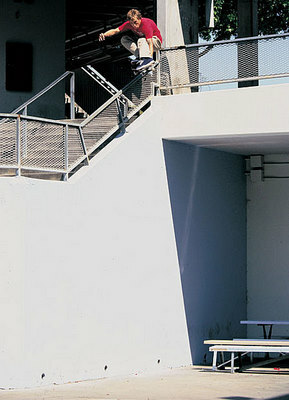 At Point Loma High School in San Diego, California. The Zero video Thrill Of It All (1997) featured Jamie Thomas. His attempt to ollie over the handrail and down. He broke his board on impact but walked away uninjured. Jamie is known for powerful handrail skateboarding. He pushed the limits of skateboarding. His biggest part was in "Welcome to Hell" by Toy Machine in (1996). I call it Welcome to Handrails. It was the first big handrail skating video. I think he became a Christian. His recent career show signs of it. Where Does Skateboarding and Religion Fit? Raised Catholic. I went to a Catholic schools. I know the faith pretty well. I recall an episode of teen rebellion. Not wanting to go to mass on Sunday and telling my parents that I was attending The Church of Skatan instead. Organised community is a good thing. It brings people together. I like that. If a church sees they can get kids in the door with a skatepark then good for them. The bait and switch will work on some i guess. Think for yourself and skate more!